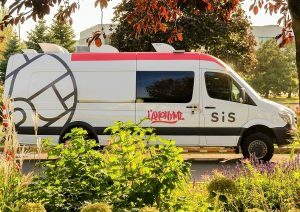 The initial approach used by L’Anonyme to reach out to populations was through outreach intervention with a mobile unit. Still today, it allows us to move around and get near living environments, in strategic stops, in order to reach at risk populations. In line with L’Anonyme’s core philosophy, the Outreach intervention program at L’Anonyme is fueled by harm reduction, a humanist approach centered on individual needs and realities in a non-judgmental and pragmatic perspective. Our team initiate contact with the people they meet through psychosocial support as well as distribution and exchange of protective equipment, among other things, in order to prevent the transmission of sexually transmitted and blood-borne infections (STBIs). That privileged contact is often a lever for intervention as it represents an occasion to build trust with people using our services and to talk about safe sexual practices or drug use. The bus runs according to two different schedules: in the evening and at nighttime. By night – During the night shift, we are mostly in the central neighbourhoods of the city such as Downtown, Centre-Sud, the Village and Hochelaga-Maisonneuve. The populations we are working with often face multifaceted challenges like drug addiction, homelessness, unnecessary litigation, violence, and mental or physical health issues. The interventions are educational and preventive in nature, focused on concrete solutions and psychosocial support. At night, people can also reach the team using the toll-free hotline on board. We can also move on demand to outlying neighbourhoods. 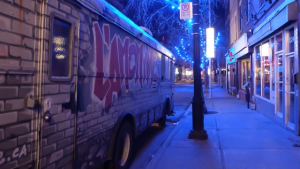 During the evening – Four evenings a week, the bus visits more outlying districts in order to welcome a younger population, traveling to Saint-Michel, Côte-des-Neiges, Notre-Dame-de-Grâce, Rosemont, Hochelaga-Maisonneuve, Mercier, Rivière-des-Prairies, Pointe-aux-Trembles, Anjou. The meeting points with the population are mostly near parks, high schools, metro stations and other areas frequented by young people, with STBIs prevention in mind. The main topics discussed concern sexuality, contraception, school dropouts, street gangs, romantic relationships, and racial profiling. The young people we meet are often from different cultural communities. We can also count on the regular presence of nurses on the bus when we are in Mercier, Pointe-aux-Trembles, Rivière-des-Prairies and Hochelaga-Maisonneuve in order to provide screening, vaccination and basic care services. Since June 19, 2017, after years of collaboration between different instances, and in partnership with the CIUSSS of Centre-Sud-de-l’Île-de-Montréal, L’Anonyme patrols the neighbourhoods of Downtown, Centre-Sud and Hochelaga-Maisonneuve as well as peripheral areas on demand, in a mobile unit entirely dedicated to the supervision of drug injection. A worker and a nurse welcome 7 nights a week, from 11 PM to 5 AM, people who wants to inject their own drug in a legal and safe framework. This type of intervention aims to avoid fatal overdoses and intervene in case of complications related to injection, prevent STBIs transmission, as well as reduce drug use and injection material in the public space. For more information, visit Santé Montréal.